Day two was a day of learning, rulers in the morning and stencils in the afternoon. Sprinkle in playing with different feet and other goodies. Every few hours we were gifted thread, rulers, stencils, scissors, bobbins, DVDs, you name it! Craziness!! All goodies to try out and to help up us with our quilting. Commotion in the hallway and someone closing the classroom doors cued me that something was going to happen during lunchtime. Soon enough we were called to lunch. Jared, the photographer, was on hand, as was Darrin, the CEO. Hummm. 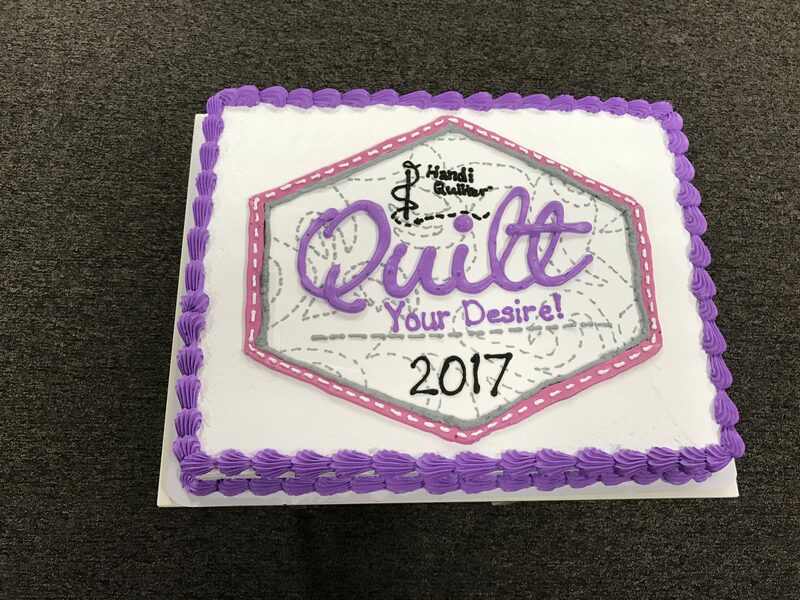 We were met with a beautifully decorated cake and discovered our name was going to be the Quilt Your Desire Inspiration Squad. Love that! Placemats with our group photo shoot from 2:00 yesterday afternoon were on the tables. Marilyn, my roommate, is on the far left. We are pictured with vintage quilts the studio educators quilted. Darrin again welcomed us to the HQ family and said we had birthdays to celebrate. Five of us (yes, I was one) have birthdays in January. The closest to that day’s date would win a prize. 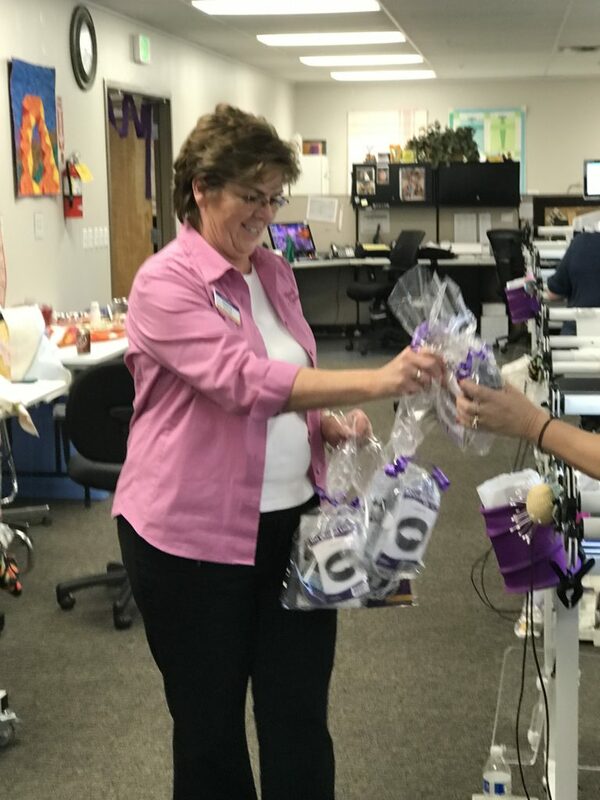 Becky’s was the closest and they brought out a very large white box with gorgeous purple metallic ribbon. It was a sewing machine!! 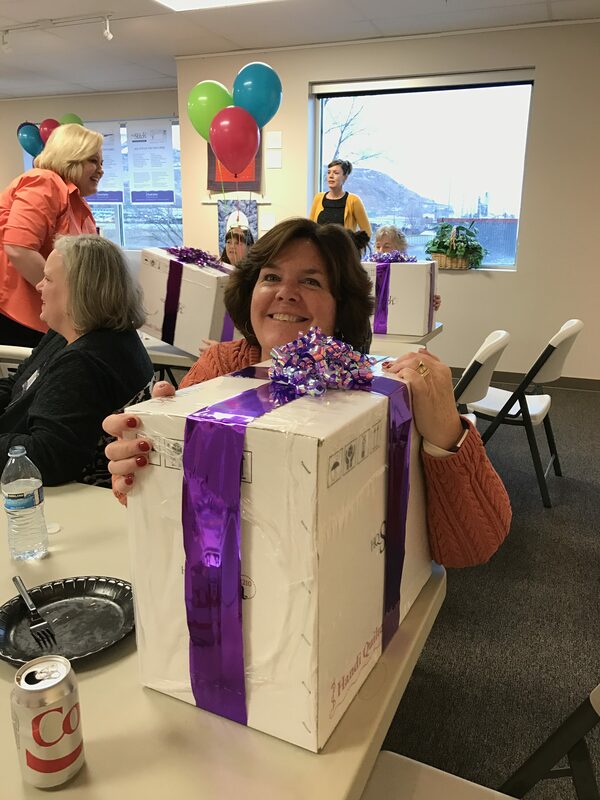 But then Vicki said, “Wait, we all have birthdays!” and they wheeled out those fabulous boxes for each one of us!! Darrin with the machine we received. 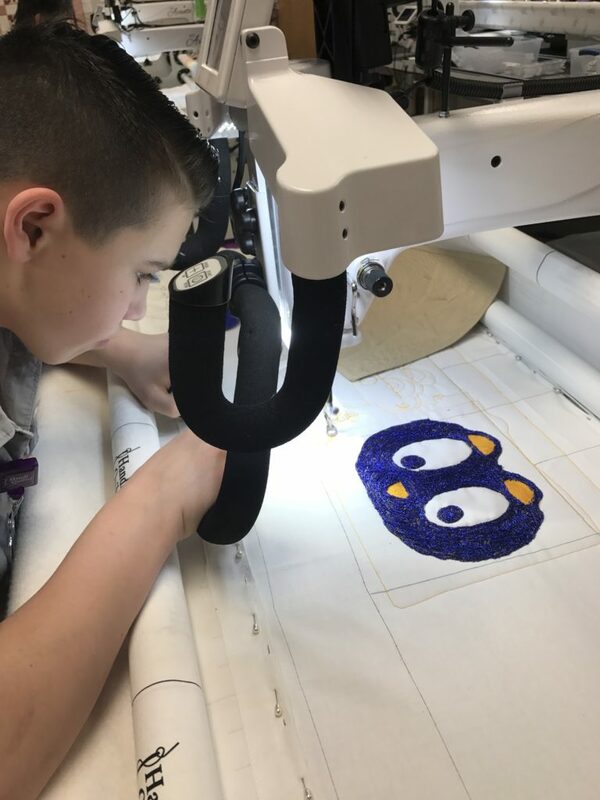 It’s an HQ 210 Stitch 8 pound travel machine!! Back to the classroom for more hands on practice on the wonderful Avantes. And more swag! Did I say more swag? Yes, more swag! We learned they would be shipping it home for us! At this time I just have to introduce you to Jace, the13th member of our squad. He is the 12 year old grandson of Helen Kay. She mentioned in her application video that she had taught him to quilt and showed a quilt he had made, so HQ invited him, too. He was a perfect addition! 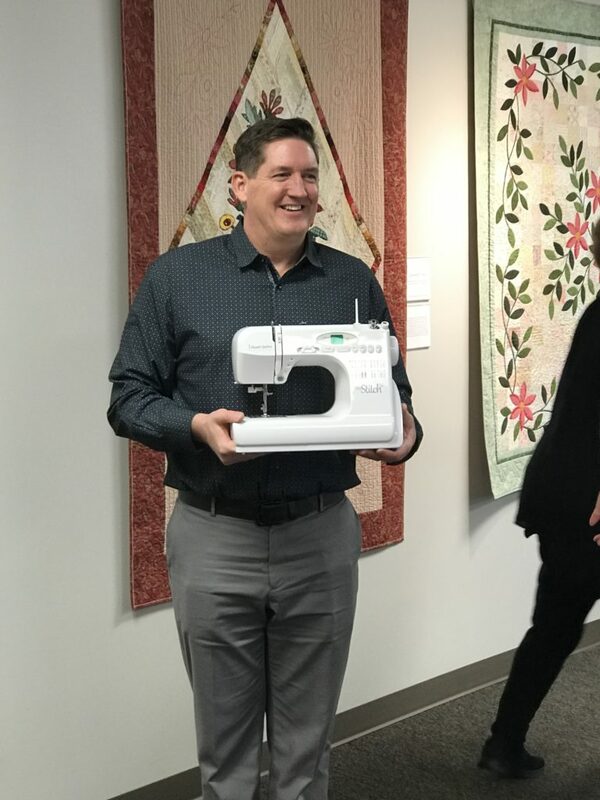 He carried his new sewing machine and thread home on the plane with him because he couldn’t wait for it to be shipped! Here he is hard at work micro quilting after trying his hand at couching. 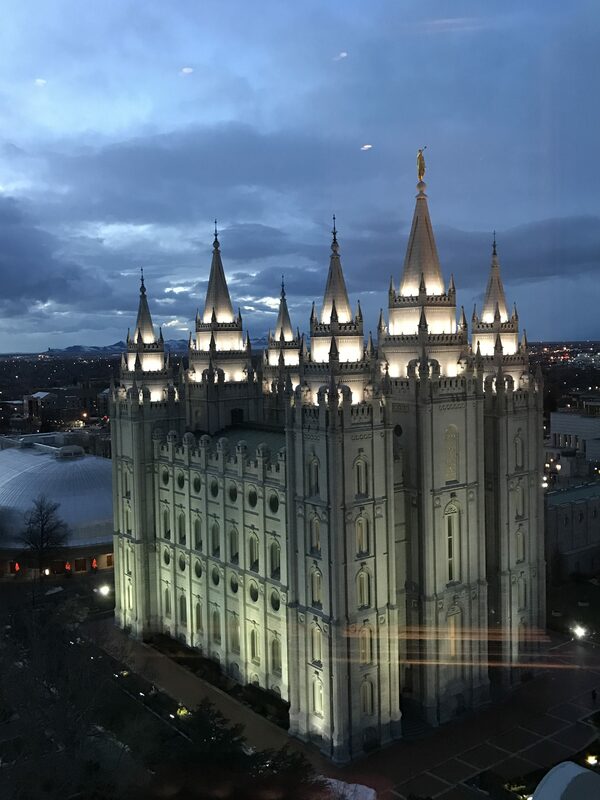 At 5:00 we were taken by a luxurious shuttle bus to the Joseph Smith Memorial Building for a fabulous gourmet buffet at the Roof Restaurant overlooking Temple Square. 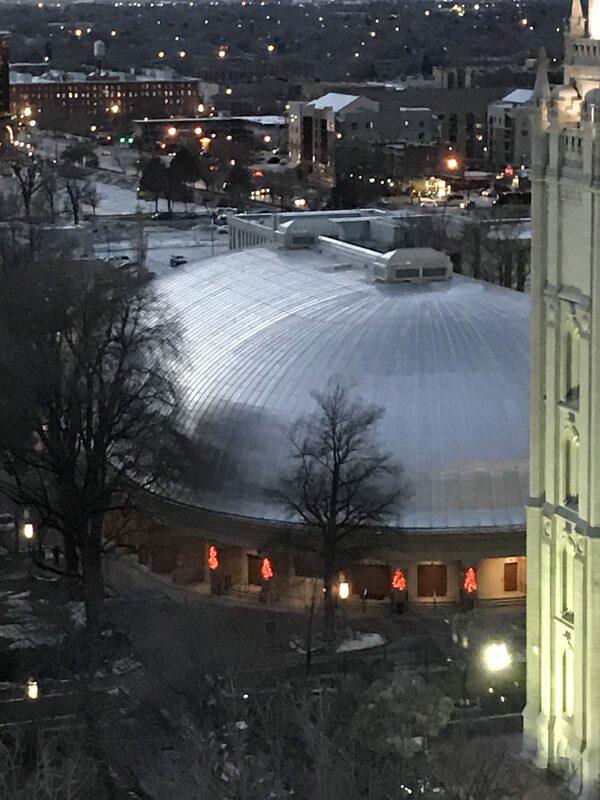 This is a view from the restaurant. What an experience this was! 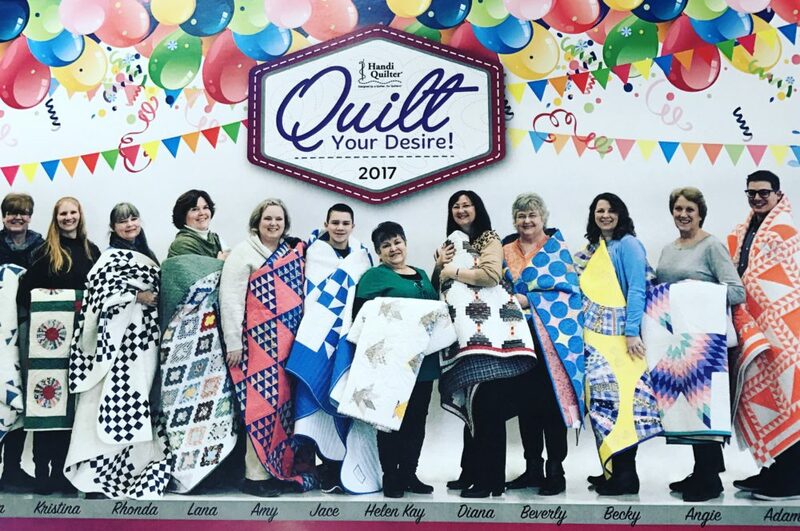 Tune in to my next post for Day 3 at Handi Quilter! This entry was posted in Handi Quilter, longarm, quilting, Simply Sixteen by Lana. Bookmark the permalink.